What sez July more than a candy tangerine Strat with gold hardware? Probably a lot of stuff, but I needed a groovy opener for this one. It just emanates heat and tangy sweetness! Mmmm! BBQ & tequila! Yes, it's July folks! Behind that rosewood is AAA flame maple. 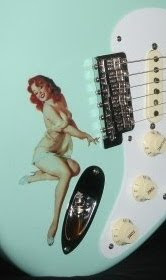 1960 specs include 7.25" slim neck, vintage pickups and hardware. Click pics for close-ups! Bizarre Guitar-Reno, NV currently lists this as a 2010 "Special Order" model. It's new, and includes COA, case candy and what looks like a brown tolex case.